Prior studies suggest that the Attentional Control Scale (ACS) consists of two correlated factors. These models do not include a general factor, though this is assumed often in theory and practice. Using an adult North American sample collected through Amazon Mechanical Turk (N = 419), we examined a revised version of the ACS with positive keying of all items (Straightforward Attentional Control Scale; ACS-S) to avoid the potential of a factor produced by mixing positively and negatively keyed items. Exploratory factor analysis using a bifactor approach was used to examine the structure of the ACS-S, which consisted of a general factor and a nuisance variance factor. There was mixed evidence of good fit for the full 20-item version of the ACS, but fit was good for a reduced 12-item version of the ACS-S. The full and reduced version were highly correlated (r = .98). Exploratory structural equation modeling suggested that the general factor of the ACS-S was negatively related to depression and both anxious arousal, as reflected by panic symptoms, and anxious apprehension, as reflected by worry. The findings suggest that perceived attentional control is uniquely related to depression and both dimensions of anxiety. ACS-S Short scores were tested as a moderator of the association between anxious apprehension and anxious arousal. The association between these anxiety dimensions was weaker at higher levels of perceived attentional control. Our findings suggest that the ACS-S is best represented as a single dimension of beliefs about attentional control which can be scored by totaling the items and that the ACS-S uniquely related to the internalizing symptoms we assessed. The findings also contribute to the understanding of how anxiety dimensions are influenced by perceived attentional control. Matt R. Judah, Kevin G. Saulnier, Nathan M. Hager, and Nicholas P. Allan declare no actual or potential conflicts of interest or sources of funding for this study. All research procedures were approved by the Institutional Review Board at Ohio University. All subjects provided informed consent prior to participation in the study. Williams, P. G., Rau, H. K., Suchy, Y., Thorgusen, S. R., & Smith, T. W. (2017). 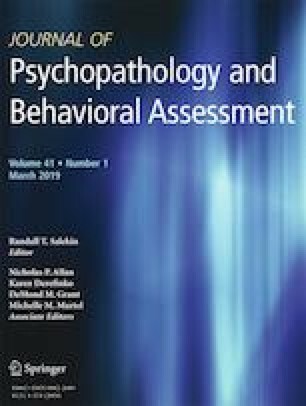 On the validity of self-report assessment of cognitive abilities: Attentional control scale associations with cognitive performance, emotional adjustment, and personality. Psychological Assessment, 29, 519–530. https://doi.org/10.1037/pas0000361.